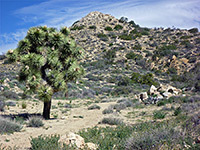 The highest elevations in Joshua Tree National Park are found towards the western edge, in the Little San Bernardino Mountains, where several summits rise above 5,000 feet, and most of the land is a mix of hills, ridges and canyons, still with many Joshua trees, often mingling with pines and a great variety of other vegetation. 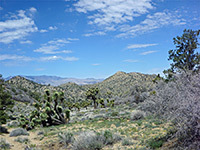 The main center for visitors is Black Rock Canyon, reached by a short road from the nearby town of Yucca Valley; here are found a campground, picnic area, nature center, horse staging area, and a trailhead for a variety of hikes into the mountains, ranging from the very short High View Nature Trail to several loops of up to 15 miles. 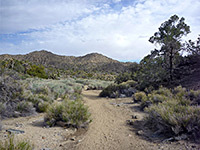 One of the most popular, though still relatively lightly traveled, is the Panorama Loop, an 2.8 mile circuit reached by walking 1.8 miles up Black Rock Canyon, and which can be combined with two short side trips to summits (Warren Peak and Morongo View), to make a round trip of 8.6 miles. About half of the journey is along canyons - some wide and sandy, others rather narrow and rockier, while the other half is over elevated ground of ridges, hillsides and peaks. 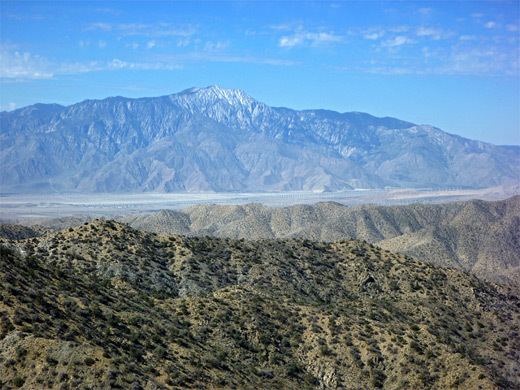 The highest sections give a 360 degree view of the surroundings as there are no significantly taller peaks nearby; the vista extends south across Coachella Valley to the San Jacinto Mountains, west to the San Bernardino Mountains and northeast to the Mojave Desert. 20 views of the Panorama Trail and Black Rock Canyon. Panorama from Warren Peak. Full screen version (22 mb). The side road to Black Rock Canyon (Joshua Lane, seemingly not signposted to the national park from Hwy 62) climbs gently sloping ground passing many nice-looking residences which have a variety of desert plants in their gardens, and ends just inside the park boundary at the campground. There is no entrance fee to visit this area. The place seems to be popular mostly with campers and horseriders rather than hikers. Rocky hills enclose the camp on three sides, covered by Joshua trees and pinion pines, while just to the east, the wide, sandy wash of Black Rock Canyon leads southwards into the mountains. The trail starts from site 30 in the campground, or from a parking area beside the entrance. 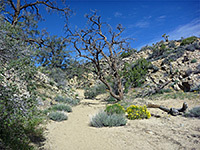 The first part of the hike is along the Black Rock Canyon Trail, heading south along the wide, flat, sandy floor, initially almost level, and soon passing the first junction, with the California Riding and Hiking Trail, signed 37.4 miles to its endpoint at the Joshua Tree National Park north entrance. Past here, the surroundings become gradually rockier as the valley sides steepen and come a little closer together. The rocks are quite different to the smooth, rounded granite of the central area of the park, instead they are darker, jagged and metamorphic, in places showing prominent twisted bands of white and grey. The next intersection is with the Short Loop Trail, which later meets the California Riding/Hiking Trail to form a 1.7 mile round trip. 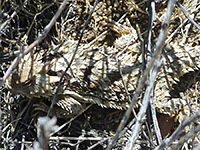 There is little change in the wash surface or the valley appearance as the main path continues south, bordered by sandy or earthen terrain, so the plants are mostly flowers and small bushes rather than cacti. A third junction is with the 2.5 mile Burnt Hill Trail, and also heading southeast, like the previous two. After a while, the gradient becomes somewhat steeper, the canyon narrower, the soil underfoot firmer and the surrounding vegetation higher, with more trees and bushes. The trail passes Black Rock Spring, a small, muddy watersource lined by rocks, just as the canyon becomes quite enclosed, and divides. 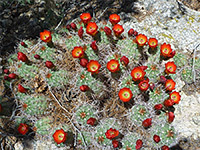 Ledges hereabouts provide good habitat for echinocereus (hedgehog) cacti, and cholla. The canyon junction also marks the start of the Panorama Loop, for which counter-clockwise is the recommended direction as the elevation gain is achieved more gradually. The path up the right (south) fork of the drainage continues climbing gently, beneath slopes home to many more wildflowers, most numerous being orange California poppies, and soon reaches yet another junction. Left is the other end of the Panorama Loop, while right is a side path to two summits. The right trail runs a little way up a shallow canyon and forks; the two branches are signed Warren Peak and Morongo View, both destinations less than a quarter of a mile away. The first path climbs to a ridge and follows it, steeply at the end, to the 5,103 foot peak, which gives good, long-distance views of the surroundings, most dramatically south and west towards Coachella Valley and the San Jacinto Mountains. There are many other summits in the foreground, similar or less in elevation, and the highest peak in the national park (Quail Mountain) can be seen several miles east. The other spur trail (to Morongo View) is even shorter, following the valley a bit more then veering south up a little incline to the viewpoint, which affords a similar panorama, about 150 feet lower than the peak. Back in Black Rock Canyon (the fifth junction from the trailhead), the Panorama Trail proceeds south then southeast up a long, wide, straight valley, quite hot and exposed in summer, containing similar Joshua trees, pines and wildflowers as before. The path ascends more steeply at the far end, up to a ridgeline, following this close to an unnamed 5,195 foot peak, and east along a narrower ridge where the land falls away precipitously on both sides. The rocks now are composed of the familiar coarse-grained granite, and the sandy soil harbors colorful blooms including lupine, penstemon and monkey flowers. The path reaches its highpoint and begins a big descent, into the adjacent valley to the north - down steeply, through one section with loose gravel, to a sandy area where the trees return, and the valley winds northwestwards and soon rejoins Black Rock Canyon at the fourth junction along the trail. From here the trailhead is 1.8 miles away.